Racism is a social issue which we ALL need to address. This is a small preliminary collection of online resources gathered by Dr Alison Phipps, myself and others which offers various kinds of advice on what you can do if you are witness to hate speech, (I am writing this with race hate in mind, but applies also to sexist, gender-based or disablist hate speech). One of the ideas behind bystander intervention is training individuals and communities to know how to act, (and how to act together, collectively, in public spaces – to support each other to act). Often people stay silent when they witness harassment, as they are frightened of intervening. However, for those who are targeted by hate, the silence of witnesses is often experienced as complicity. Follow @SLATUKIP, Hope not Hate and other antifascist groups. Show solidarity with immigrants, refugees and those in your community who are on the receiving end of abuse. Don’t leave it to those on the receiving end to stand up and criticize xenophobia and racism in the press or in public spaces. Listen and believe that this is happening and do what you can to counter it in the spaces around you, workplaces, family and friends. See also What is bystander intervention? – an OPENLEARN lecture here on the history of this term from Dr Jovan Byford (Department of Psychology) at the Open University. United Against Racism have some guidelines here: “Who Not, it Not You? At UWE, Dr Rachel Fenton was the Principal Investigator for the Public Health England-funded bystander intervention project. The Intervention Initiative is an educational programme for the prevention of sexual coercion and domestic abuse in university settings, through empowering students to act as prosocial citizens. While the UWE bystander project focuses on sexual and gender-based violence much applies in other situations. Not everybody will want to use or access police support, but if you can/do, you can report hate crimes online : Police advice is to Call 101, contact Crimestoppers or http://www.report-it.org. Y-Stop and Search addresses the problems experienced during a police led stop and search. It aims to give you the skills to handle stop and search and your interactions with the police, as well as provide tools for advice, empowerment and reporting police behaviour. The campaign began at UCL and has now spread to several universities across the country, including Leeds, Manchester and Oxford as part of the movements to decolonise education. It is student run, and supported by Lancaster’s Student Union and some Lancaster academics. It is a movement to decolonize the curriculum on offer at this university. This requires looking reflexively at the curriculum; learning to ask questions, such as why we have certain topics made available, whilst others are omitted; and creating a voice for those who are underrepresented by the education system. In the words of Nathaniel Coleman, who founded the movement at UCL, the campaign is it to “mobilise a social movement around the unifying symbol of the Eurocentric colonial kyriarchy,” basically moving curriculum on from white, Eurocentric, imperialist colonial washing, to a new paradigm of looking at the past and its effect on how we read it today. “Black” and “white” histories in this country go far back together and are intrinsically linked, so why is that we are still saturated in works by predominately white education makers, whilst ethnic minorities are essentially written out of histories and curriculum at many educational establishments? Further materials that may be of interest are below. West Baltimore, 8.39 am April 12: Freddie Gray, a 25-year-old black man, stood on the street talking with friends. Police officers approached on bicycles and made “eye contact” with Gray, who then attempted to leave. The police chased him and video footage shot on neighbours’ mobile phones shows police holding Gray face-down on the pavement. One witness described how an officer pressed a knee into Gray’s neck as he was handcuffed, while another bent his legs upwards: “They had him folded up like he was a crab or a piece of origami”. By the time the police van arrived with Gray at the Western District police station some 45 minutes later “he could not talk and he could not breathe”, according to a police officer quoted in the Baltimore Sun report. It was only then that police called medics who transferred him to hospital. Doctors determined that Gray had three fractured vertebrae and a damaged larynx, his spinal cord 80% severed at his neck. Gray died of his injuries a week later on April 19. “No Justice, No Peace” has echoed through the streets as thousands of people have protested Gray’s death. Protest marches on April 25 and walk-outs of students on April 27 were followed by what some call rioting, others unrest or rebellion. Officials and mainstream news coverage have decried property destruction, including burning of police cars, and theft. Baltimore’s mayor, Stephanie Rawlings-Blake, declared that “violence will not be tolerated” and the governor of Maryland, Larry Hogan, called city residents “lawless gangs of thugs roaming the streets” before declaring a state of emergency, suspending habeas corpus, implementing a 10pm curfew, and deploying National Guard troops. Gray’s death at the hands of the police was the latest to provoke protest. Natalie Finegar, the deputy district public defender said that it was a “daily occurrence” for her clients to describe some sort of mishandling by the police. These range from “jump outs” where officers spring from patrol cars and shake down a suspect, to serious assaults. The city of Baltimore has paid out more than US$5.7m in undue force lawsuits between 2008 and 2011.
been mis-characterised pretty much by mainstream sensationalists who come down here to soak up the angel dust of civil unrest and sell it to white America. It’s fun. I get it. You know? Look at them. Black rage. It’s nice. But property destruction is not equivalent to death – particularly in a context where so many black people are killed and harmed by police with near impunity. It is telling that there are no comprehensive data on homicides by police in the US. A partial snapshot from recent FBI data reveals a white police officer killed a black person in a “justifiable homicide” about twice a week between 2005-2012. Anger over police treatment of black suspects. 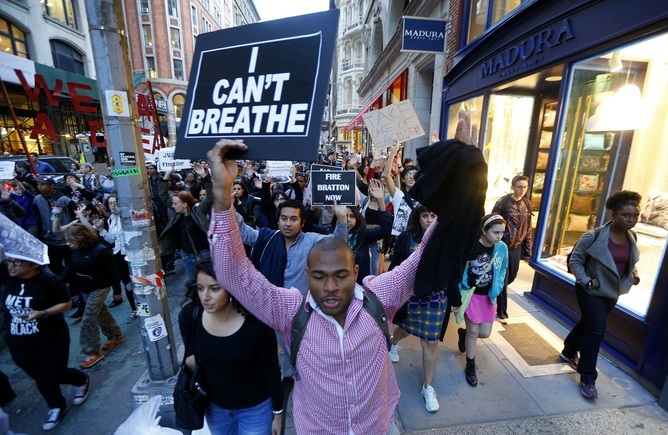 The protests communicate a legitimation crisis over policing in the United States. A cycle of renewed dissent against state racial violence has become increasingly visible since July 2013, following the acquittal of George Zimmerman for the murder of Trayvon Martin. “Black Lives Matter”, “Hands Up, Don’t Shoot”, “I Can’t Breathe” and “Shut It Down” have become protest slogans after the killings of Michael Brown in Ferguson, Missouri and Eric Garner in New York City. 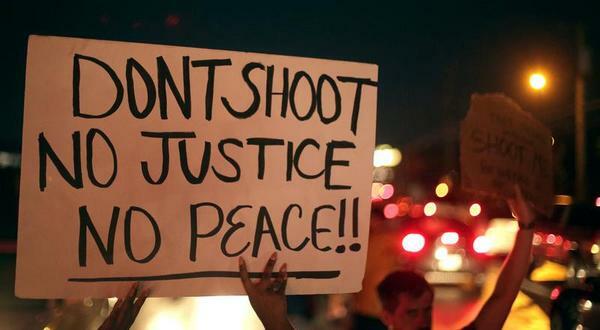 Across the Atlantic, “No Justice, No Peace“ was also the cry of protesters gathered to hear a verdict of “lawful killing” in the case of the police shooting of Mark Duggan in London, 2011. Duggan’s death sparked the most extensive riots in recent British history. As with recent events in the US, the English summer riots of 2011 raised serious concerns about policing within inner-city communities. The findings of the 2011 Guardian-LSE research project, Reading the Riots: Investigating England’s summer of disorder, suggested that the riots were motivated by a sense of “poverty, injustice and a visceral hatred of the police”. Some 73% of people they interviewed said they had been stopped and searched by the police at least once in the previous year. Time and again, anger over perceived misuse of “stop-and-search” has been one of the causes of rioting in Britain. In 1981, riots in Brixton sparked three months of rioting by black, Asian and white youths across most of the country’s inner-cities. The Brixton uprising was triggered by Operation Swamp 81, which saw the police employ ancient vagrancy legislation, called “sus laws” (suspected person) laws’, in a mass stop-and-search operation. Britain’s SUS laws in action – to often if you are black or ethnic minority. The Scarman Report into the causes of the 1981 riots stated that the black population of Brixton had been subject to “disproportionate and indiscriminate” policing. Sus laws were repealed yet stop-and-search substantially increased. An estimated 1m stop and searches are carried out in the UK each year and in 2009-2010, according to the Equality and Human Rights Commission: “Black people were stopped 23.5 times more frequently than white people and Asian people 4.5 times more frequently. 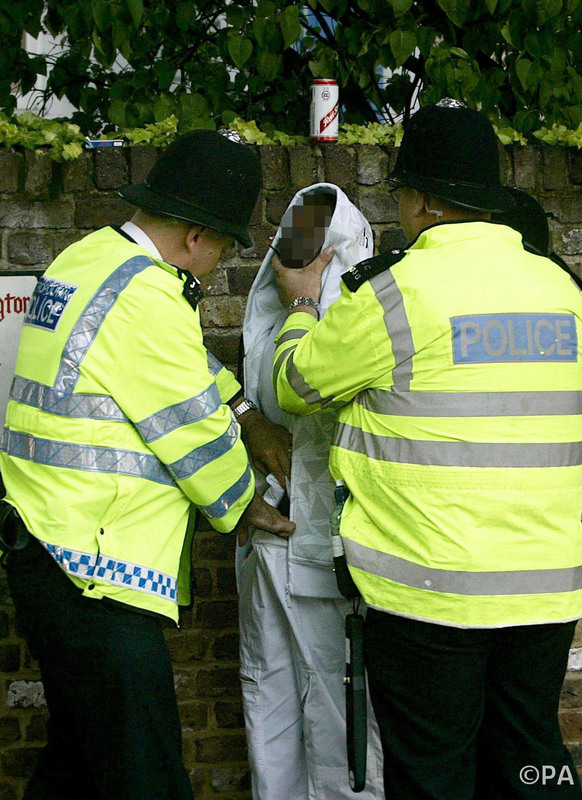 In 2014, a revised code of conduct on stop-and-search was introduced; recent figures show a 12% reduction, but more radical reform is required. Stop-and-search is a day-to-day expression of violent relationships between police and communities. People interviewed by StopWatch detail the enduring stigma affected by these policing practices. Police harassment of black citizens communicates authoritative messages about the place of ethnic minorities in society. Racial discrimination intersects with other inequalities: poverty, rising economic inequality (between the richest and the poorest and between ethnic groups), joblessness (in 2012 the unemployment rate for black youths in the UK was 55.9%, double that of their white peers), high levels of incarceration, inadequate housing, unequal access to education and healthcare. Fifty years since the civil rights movement and the ostensible end of state-sanctioned discrimination, austerity and welfare retrenchment has created even deeper divides. A recent special issue of Feminist Review on the politics of austerity details the multiple ways in which “divides of gender, race, ethnicity, sexuality and class” are intensifying. The UK and US are relying on the same forms of policing to resolve the resulting economic and political conflicts. Racial and economic inequality fuelled the riots in London 2011 and the same thing has sparked the unrest we see in Baltimore and other US cities today. Imogen Tyler is Senior Lecturer at Lancaster University. Jenna Loyd is Assistant professor at University of Wisconsin-Milwaukee.